True to their roots in metal, stone, and wood, typography is generally imagined to be fixed in place. It’s hardly the sort of thing you’d imagine transforming in time, the way you would a musical utterance. 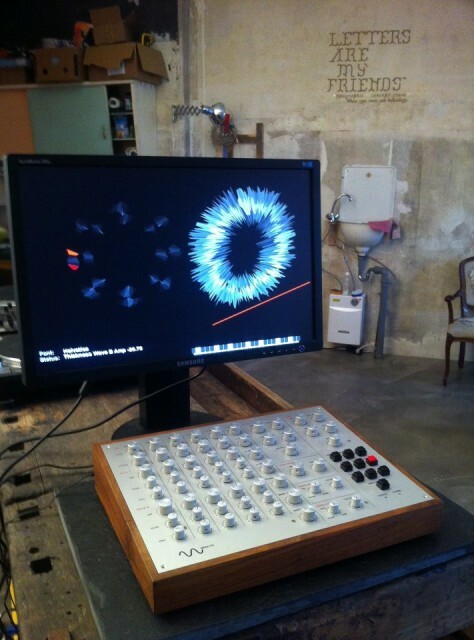 Yet the Meek FM Typographic Synthesizer defies that convention. The 2007 project, designed by Rob Meek and Frank Müller, was recently exhibited at Berlin’s Letters Are My Friends. That makes it a perfect time to revisit the project, and its notion of typography as something fluid, malleable, and temporal in the way synthesized music would be. The combination of a custom built hardware controller and software generates new shapes and sounds out of pre-installed typeface vectors. Like a real musical synthesizer, the Meek FM can shape and modify forms (+ sounds) with several parameters. This device shows that there are still a lot of untouched possibilies in realtime graphical instruments.